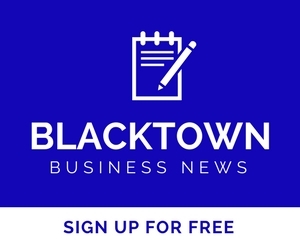 Here you’ll find details of business news in the Blacktown area. News that can assist your business find new leads, save money or bid for new contracts. With the latest company announcements, updates, sales offers, expansions and details of new businesses entering the region, as well as business planning and Greater Sydney Commission updates you’ll be kept in the know. 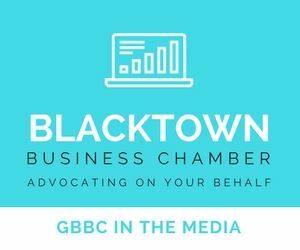 The Annual budget launch for Blacktown City Council is on the 29th May 2018. The Annual Charity Golf Day. The Weather was perfect for a round of 18 holes at Stonecutters Ridge Golf Club. Great support from local businesses supporting our two charities of choice - The Red Shield Appeal and Kids West Children's Charity. Thank you to McDonald's Mt Druitt as a Hole in One Sponsor; our Hole Sponsors and all our supporters. Get on track and make GBBC the healthiest Chamber in the land! We are on a quest to "GET HEALTHY AT WORK" and it all starts on Monday February 22nd with a walking challenge. Those who were at February's Business After Five event had the chance to join a team on the spot, but for those who missed out, we invite you to share the information below to get as many people on track as we can. Join a team today! 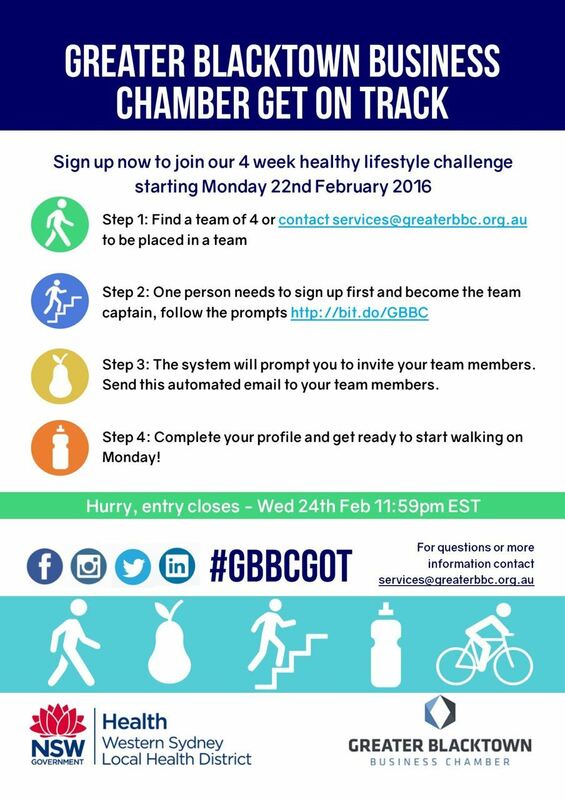 Help us walk our way to health and fitness and make GBBC the healthiest Chamber in Australia. Prizes will be awarded to the team and individual that walks the furthest during the 4 week challenge. GBBC have made a 2016 resolution. Have you? We are undoubtedly all guilty of slight overindulgence during the holiday season and now here we are…facing the latter half of January and grappling to rediscover our 9-to-5 mojo. Perhaps you have made a New Year’s resolution or two, is 2016 the year you get healthy or achieve business success? According to research, 64% of resolutions are maintained until the end of January.1 From there, it's a slippery slope - just 6% last 12 months. But don’t let that put you off, people who set a clear and attainable resolution are 10 times more likely to achieve them. Whether you already have your resolution or you’re a little late to the game there’s still 11 and a half months to go. That’s why there is no better time than now to start (or revisit) your health goals. Our 2016 resolution is to be the healthiest business chamber. We’ll do this via this monthly blogs on health topics, supporting members with the Get Healthy @ Work program and an exciting member’s only health challenge. Stay tuned to learn more about our upcoming health challenge, here’s a clue – it will provide opportunity for all our members to get back on track with their health! Source: (1) Auld Lang Syne: Success predictors, change processes, and self-reported outcomes of New Year’s resolvers and nonresolvers, by John C. Norcross, Marci S. Mrykalo, Matthew D. Blagys , University of Scranton. Journal of Clinical Psychology, Volume 58, Issue 4 (2002). The average Australian spends a third of their life at work – that’s potentially a lot of time slouched at a desk and a few too many 3 o’clock sugary energy hits. As chronic disease rates sky rocket in Australia it’s time we think seriously about how workplaces could help reduce diabetes, heart disease, obesity and some cancers, by promoting healthy lifestyles. There are many low cost and low effort solutions workplaces can implement to keep employees healthy. Any change you make will be most effective if it addresses a need. The same can be said for being a successful business, you have to have a target and meet their needs. Look at your workforce, what are their needs? Are they inactive? Eating poorly? Smokers? Stressed? Creating a healthy workplace isn’t about removing all the ‘bad’ things, it is about providing more opportunities for the ‘good’ things and a little nudge for people to make healthier decisions. A few simple things you could try are – moving printers and copiers further away from desks, provide healthy food at staff BBQs, introduce standing or walking meetings, or introduce a few healthy snacks in the vending machine. Once you’ve started with a few simple changes it’s time to be serious – what can your workplace do to help people make big lifestyle changes? Consider things like purchasing standing work stations, providing a lunchroom fruit bowl, or providing facilities to support people to ride push bikes to work and even out to work related meetings. Don’t forget just because it’s there doesn’t mean it will be used, you’ll need to promote these new initiatives to staff and encourage uptake, behaviour change takes time and education. As part of the 2015 Sister Cities Australia National Conference being hosted by Blacktown Council, interested companies and individuals are invited to attend a FREE, ‘Doing Business in Asia’ workshop. Hear from leading industry and government experts about the latest trends, issues and opportunities relating to Australia’s largest, 2nd and 4th largest trading partners. Steer your business to safety and prosperity with the Protect and Grow special event series. Proudly sponsored by Telstra Business Centres West Sydney, Davies Collison Cave and KPMG. With high calibre presenters this special event series has been designed to educate and entertain our audience. You will take away exclusive insights and techniques to grow your enterprise and protect its value. Facilitator, Dr Jim Taggart is a respected business leader and Deputy Chairman of Regional Development Australia. Jim will bring his unique brand of business insights about networking and social capital. Each event is held over 4 hours from 8.30am to 12.30 pm with optional lunch and networking afterwards. Attendees receive a comprehensive work book. This article is to update you on recent progress towards an airport for Western Sydney and provide information on the unique opportunities an airport offers. A new airport has the potential to boost Western Sydney’s economy and liveability, providing a growing region with the world-class transport and employment infrastructure it deserves. Please don’t hesitate to circulate this information within your organisation or to your members who may be interested in learning more about the proposed airport. Please email WSU@infrastructure.gov.au to add others to the distribution list. On Wednesday 26 August, Deputy Prime Minister and Minister for Infrastructure and Regional Development Warren Truss visited the site with Federal Member for Macarthur Russell Matheson to mark the declaration of the site. The declaration paves the way for key planning steps to be taken, including the determination of an airport plan for the airport, once the environmental assessment process concludes. It will also enable airspace around the site to be protected. A draft environmental impact statement (EIS) is being developed and is expected to be released later in 2015. The Australian Government is getting on with the job of planning for an airport for Western Sydney. The EIS is a key step in progress towards an airport for Western Sydney. Community and business groups will have the opportunity to comment on the draft EIS, which will consider the environmental, social and economic aspects of developing and operating the proposed airport, when it is released. This will be taken into account before the EIS is finalised. A Western Sydney airport will help support economic growth and investment opportunities in the Western Sydney and broader NSW economies by providing Sydney with a 24-hour airport. Curfew-free operation would better align Western Sydney businesses with key global trading partnersand sources of tourists visiting Australia, offering the region’s economy a competitive edge. Melbourne Airport accommodates an extra two million passengers a year thanks to its curfew-free status, adding around $590 million annually to the Victorian economy through visitor spending. Brisbane Airport also operates without a curfew. A Western Sydney airport would be a full-service airport, catering for all types of domestic and international passenger and freight aircraft. In its initial phase, starting in the mid-2020s, the Western Sydney airport will have a single runway of approximately 3.7 kilometres in length. This will accommodate all modern aircraft up to and including the Airbus A380. The Australian Government is planning an airport for Western Sydney that will grow over time to meet increasing demand. By around 2050, an airport could require a second, parallel runway. As the first greenfield airport development of its scale in Australia for decades, a Western Sydney airport will be designed to take account of how we will travel in the future. Whereas existing airports are frequently retrofitted to incorporate new technologies and meet changing user expectations, a new airport could harness design innovations to improve the speed, efficiency and ease of use of terminals for passengers and airlines alike. Transport for NSW is working with the Australian Government to identify a suitable passenger rail corridor for preservation in south west Sydney to serve a Western Sydney airport, the extended Western Sydney Employment Area and the South West Growth Centre. The Australian Government is future proofing for rail by planning for a rail corridor and station at the airport site. At present, only Australia’s largest (Sydney Kingsford Smith) and third-largest (Brisbane) airports have dedicated rail links. The Australian Government is taking a roads first approach to the proposed airport, with work already underway on projects under the $3.6 billion Western Sydney Infrastructure Plan. More information is available from Transport for NSW at http://www.transport.nsw.gov.au/projects-swrl-extension-corridor-preservation.